I was introduced to kelly wearstler's designs a little over a year ago while working with ann sacks and became immediately enamored. her designs are unapologetically glamorous and chock full of materials, patterns, and pieces that shouldn't work, but just do. take a look at some of our favorite kw interiors. ...marble work that you couldn't even see in the louvre. one of the things that initially drew me to kelly's interiors was her heavy usage of stone and statement wallpaper. she often makes patterns by mixing marbles to create some incredibly jaw-dropping works. all kelly everywhere! her signature linear black and white zigzag pattern adorns the ceiling along with an uber traditional chandelier. 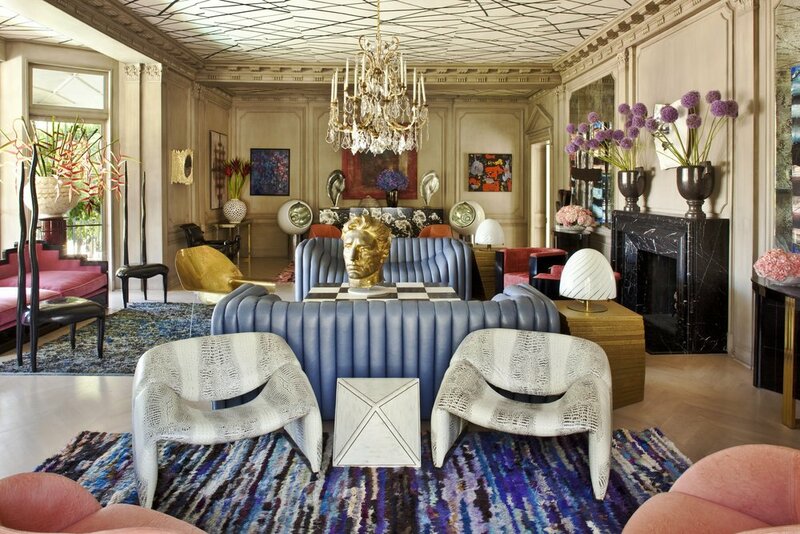 snakeskin deco chairs and parisian influenced millwork complete the kelly look. statutes and the human form are a staple in all of kelly's interiors; from large-scale figures to seats in the shapes of hands, it's unlikely you'll find any wearstler room without some sort of shape-inspired decor. 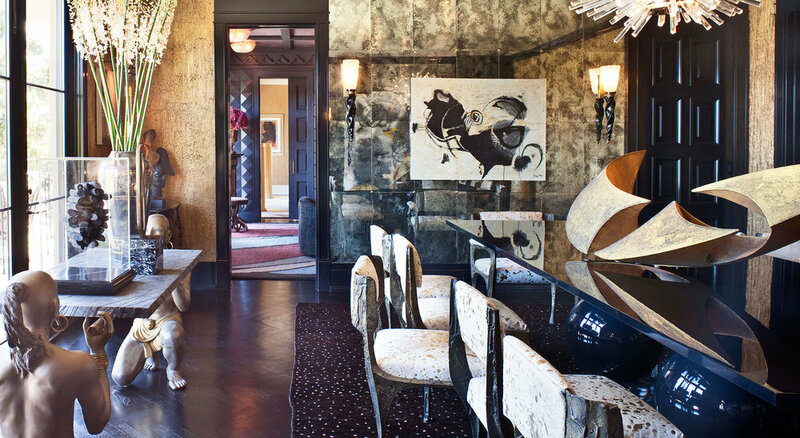 bold punches of color mixed with lacquer finishes and oriental touches created this beacon of a room. 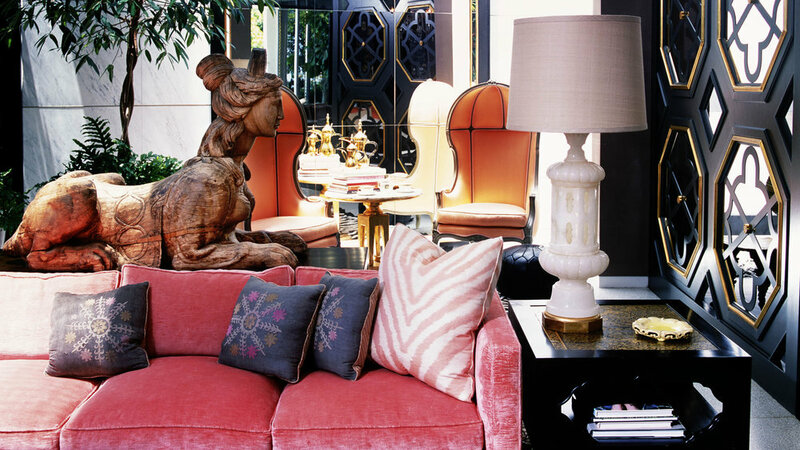 though many designers would stray from giving an oversized sphinx statue prime placement in the center of a room, kelly embraces the challenge, and the result is a deco dream. wearstler's affinity for colored, geometric marble isn't limited to the floor. she often takes it all the way up the wall to the ceiling for an extra dramatic effect. is this library a freestanding building? because we can't quite imagine going anywhere else. this giant nero marquina statement wall and spiraling brass staircase mixed with the symmetrical striped rug wearstler designed herself to perfectly modernize what's traditionally thought of as an old world residential library. our breath was ~gone with the wind~ when we saw this bespoke brass staircase. kelly translated this zebra fabric into a mixed marble floor, incorporating brass inlays to match the table and chair details. 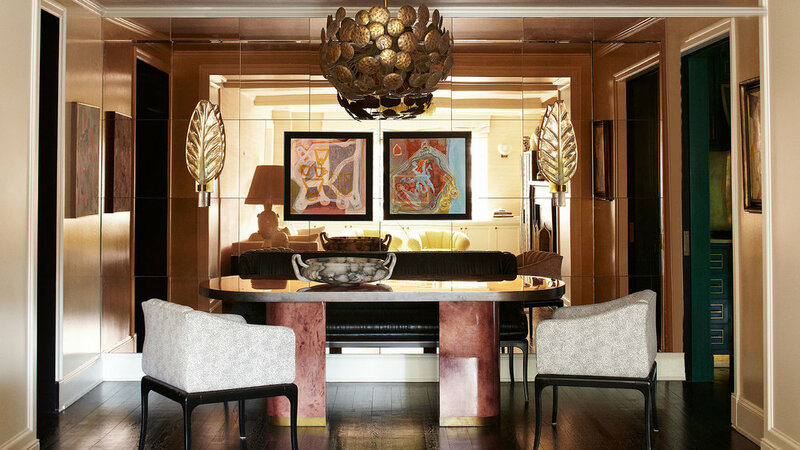 adding a punch of color with some oversized deco art and including a sculptural form on the table gives it just the kelly touch. does your little girl want a pink bathroom, but you...don’t? call in kelly wearstler, who'll make both your girl's and your wildest dreams come true by adorning it in a floor to ceiling PINK STONE pattern, making you wish you were a little girl again. on our list of rooms you'll never get bored looking at; the incredible statement wall. the mosaic floor. that vanity. the chandelier. it's safe to say, a kelly interior is far from just that - safe. another classic wearstler room and that signature geometric multi-marble we can't get over. we figured this room was best to wrap things up, as it encompasses everything we know kelly to be: glamour, and everything but "safe." the geometric, mixed-material floor, the incredible statement wall (okkkkkkay now, btw), the brass accents, pops of color, ruched leather, and that bardiglio marble table top. too much going on in one room? not if you're kelly. asides from her actual designs, what we might love most about ms. wearstler is how she's managed to create such a signature look. though her rooms vary SO drastically, she has an aesthetic that can be spotted from a mile away. her style translates straight through to furniture, tile, and wallpaper lines. on top of having a brick-and-mortar boutique, she's also a mom, and a flipping stunning one at that. we're not very convinced there's anything she can't do.